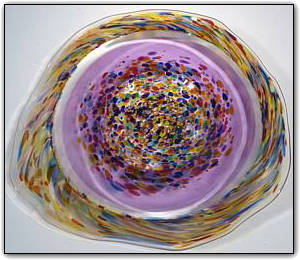 This incalmo wallbowl features multiple separate sections coming together to form an absolutely stunning piece of glass wall art. The inner and outer sections feature an End Of Day® color mix, meaning they were made with a variety of colors used throughout the day containing nearly every color in the rainbow. The End Of Day colors also have real gold adventurine added for that extra gold sparkle... the more light you shine on this piece, the more it will sparkle! The center section is a lovely purple providing the perfect compliment to the End Of Day® colors. Each section was formed as its own separate molten bubble, then they were fused together and blown out as one unified bubble using the incalmo method.